The majority of British Muslims are not in favor of violent retribution for those who publish images of the Prophet Mohammed, nor do they sympathize with fighters traveling abroad to fight with Islamists, a poll reveals. The ComRes survey, compiled for the BBC, found that two-thirds of respondents felt acts of violence against people who produce images of the Prophet Mohammed could never be justified. However, 27 percent showed some sympathy for the motives behind the Paris attacks. In January, extremist Muslim gunmen launched an attack at the Paris offices of satirical magazine Charlie Hebdo, several years after it published cartoons depicting the prophet. The survey, which took information from 1,000 British Muslims during the weeks following the Paris attacks, found that 80 percent of respondents were deeply offended by images of the prophet, and 32 percent were not surprised by the attacks. 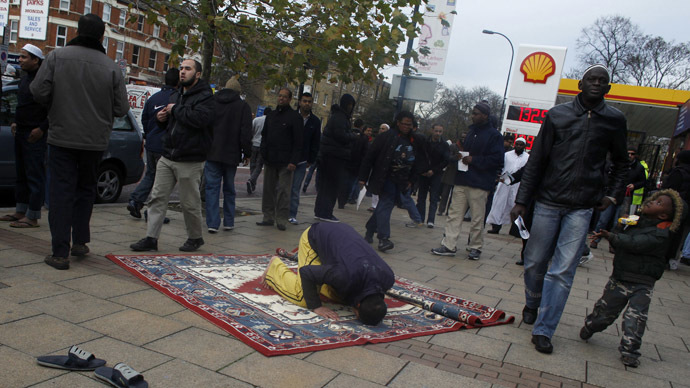 The results further suggest that half of Muslims living in Britain feel they suffer faith-based discrimination, and believe the country is becoming less tolerant. Nearly 50 percent said they feel prejudice against their faith makes being Muslim in the UK difficult, with 35 percent saying they think the majority of British people did not trust Muslims. Despite 95 percent saying they feel loyal to the country, 20 percent of Muslim women and 10 percent of men said they do not feel safe living in Britain. One Muslim student, Samaia Aslal, told the BBC she felt the media was responsible for alienating British Muslims, subsequently leaving them open to attack. “It is up to the rest of British society to stop looking at us as some kind of threat, to accept us. To not always ask us how British we feel, that’s as stupid as asking ‘How do you feel about your red hair today?’” she said. “To ask this whilst alienating us, spying on us, making us feel like we don't fit in…” she added. “There is no Islamic regulation or law that prevents integration. Everyone should be treated as equal: Muslim, white, black, Asian, as the prophet himself has said,” he said. “But this is not what Islam is about. Islam is about peace, love and harmony,” he said. The results come as increasing anti-Islamic sentiment sweeps across Europe in the wake of the Paris attacks. The far-right group Pegida, which aims to ban Islam and has already held demonstrations in Germany and Austria, has planned its first UK rally on February 28 in Newcastle.